I’m a California girl at heart, whose soul now belongs to New York. I’m a jaded, romantic, who believes in crazy-about-you love. I’m a daydreamer and goalkeeper. And I’m always planning my next adventure. 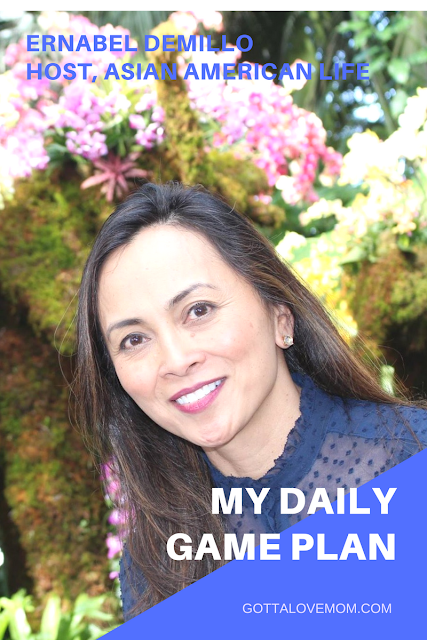 My weekday routine, during the school year may scare people away, so I’m going to tell you what a typical Sunday is like. I’m the first to get up and my dog, Stella follows me downstairs. I love the quiet stillness in the morning in my kitchen, with the sun streaming in. I start my day with a glass of warm lemon water – and coffee with almond milk and cinnamon. Then I walk Stella. We live on an acre of land and our backyard looks like a park. It’s a nice meditative time with her, until she sees a rabbit or deer and then I have to chase her down. I have a nice breakfast, then it’s off to work out. I’m currently obsessed with TRX/Spin fusion classes and Pilates. I work out at least 4 days a week – 6 days when I’m off from work. Then I head to the grocery store. I love cooking elaborate meals on the weekend. What is your everyday “go-to” outfit? I don’t have an everyday “go-to” outfit, but I do have my go-to designers. And it’s changed over the years. I’m currently in French magazine editor mode and loving Sezanne, Anine Bing, Rag and Bone, Isabel Marant and Madewell. I bought a Chloe Marcie bag in Paris two summers ago, which I still use everyday! What are you most thankful for in the morning? That I didn’t gain any weight. Just kidding. That I woke up. As a mother, what is your role in your daughter’s everyday life? I am her mother, adviser, biggest cheerleader, chauffeur and secretary. You make time to put together “Mother and Daughter trips” and “Girls Night Out”, what advice will you give mothers about the importance of building such relationship. What’s your most memorable mother-and-daughter get together? I’m a strong supporter of female bonding! I love my Mother/Daughter adventures with my daughter and Girl’s Night Out and Vacations with my closest girlfriends. My advice to mothers is to just do it. Just carve out the time and go for it. It’s also fun with another mother/daughter team. My daughter and I have taken numerous trips together – short trips to Washington D.C., Mohonk, NY, Charlottesville, VA ; across the country several times to California. But our most memorable trip was our recent trip to Tokyo together. I even wrote about it in my blog, It's A Belle Life. You’re an Emmy-award winning journalist and reporter, a mother, a wife, a college professor and a Board Member of a non-profit organization (ARK). Is there such a thing as “Having it all”? To be honest, I don’t like that phrase “having it all”. It’s a label that expects too much of women. I like to think that I have the right balance in my life. And I really couldn’t have that balance without a supportive partner, who is also my biggest cheerleader. I have an amazing family life, but I also enjoy working as both a college professor and journalist, while also making time not just for my family, but for my friends and organizations that mean a lot to me. I’m a Leo. If you cross me, be careful. I growl. Do you have any advice for anyone who want to pursue journalism? Journalism has always been a tough career choice. You have to be passionate about it. When I was younger, it was described to me as a calling, not a career. And that is very true. It’s a job with the highest highs and the lowest lows. So, if you can’t handle that rollercoaster, it may not be for you. Finally, be well informed and hone your writing skills! Who is that one person you turn to – to celebrate milestone and/or to vent out frustrations? Just one?? That’s tough in English. So my word is the German word: “Gerborgenheit” which means security, warmth, protection, trust and love – all the essential things we humans need. What’s the one advice you give your daughter? What’s the one advice from your mom do you remember the most? Pray, God is always listening. Read a book. I’m currently reading Pachinko, by Min Jin Lee. Ernabel, thank you for doing this. Congratulations and Good-luck! Ernabel Demillo is the host of Asian American Life (AAL), a prime-time news magazine that addresses topical news, in-depth feature reports and untold stories of the Asian American diaspora experience to an all-inclusive audience. The show airs monthly on CUNY-TV (Ch. 75, 25.3) and in syndication on NYC Media/Ch. 25 and PBS stations across the country, including Chicago, Hawaii, Salt Lake City, Austin and more. Host Ernabel Demillo was nominated for Best Segment in the Historical/Cultural category for her feature “Ties that Bind: Filipinos in New York” chronicling the little told history of Filipino immigration to New York. The 60th Annual New York Emmy Awards will be presented at a Black Tie Gala on Saturday, May 6, 2017 at The Marriott Marquis ~ Times Square. Announcement of the 60th Annual New York Emmy nominations was hosted by Denise Rover, President, New York Chapter of the National Academy of Television Arts and Sciences (NY NATAS), at CUNY TV’s Himan Brown studios on the morning of February 23. You can follow AAL on Facebook, Twitter, and Instagram. Follow Ernabe Demillo on Twitter.